No Limit Flashy and fancy show stopper with super attitude, scored a clear 10 at his stallion licensing! 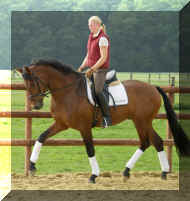 This elastic Lauries Crusador grandson is a definite FEI candidate with outstanding gaits! 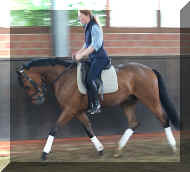 Donna Doria SPA, real fancy mover with super performance test! 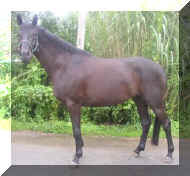 Superb elite filly by Sir Donnerhall (Sandro Hit/Donnerhall)! 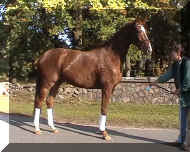 Rock'n Roll Ribbons in dressage horse classes, this is a proven show horse already! 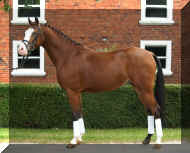 Latimo World class bloodlines, black Latimer/Donnerhall son, amateur safe! 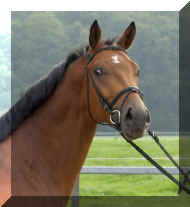 Kimba Very nice dressage horse or hunter, perfect lady or young rider horse! 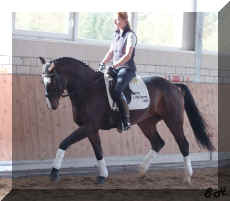 Fly Away HW FEI prospect by Fidermark - wow - look at this movement!